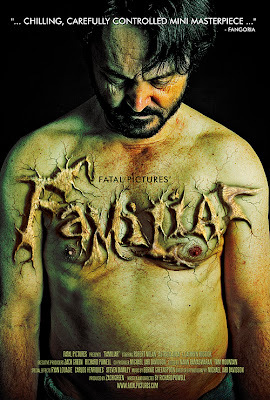 FAMILIAR is the newest horror short film from writer/director Richard Powell and producer Zach Green. cinematography & co producer Michael Jari Davidson, Presented by Fatal Pictures, FAMILIAR stars Robert Nolan, Astida Auza and Cathryn Hostick as the seemingly idyllic yet ultimately doomed Dodd Family. FAMILIAR is currently in post-production and I’m looking forward to seeing the finished film, from the same team that brought us WORM. It’s difficult to predict what we’ll get from Fatal Pictures, but one thing’s for sure… it’s bound to be dark, disturbing and enjoyable.